Please note that you will see that there are no recent reviews between November and April, this is because we go In November and we have regular Snowbirds who stay every year from January to March every year and they have previously submitted a guest review. We have just returned from our 2nd visit to this amazing villa and had yet again a fantastic stay. Firstly, it was such a pleasure to deal with Derek and Wendy again, Derek has such wonderful knowledge of the area and kindly shares this with his guests. It is evident that the villa is a special place and as such is so carefully looked after with every amenity and comfort provided for their guests. Derek is very attentive and quick to reply to any emails or questions. Secondly the villa itself - it is incredible, the villa is equipped with everything you need for your stay as well as providing extras for a visit to the beach - chairs, cool box etc. It is well decorated and beautifully clean and tidy, it has 4 lovely spacious bedrooms, 2 of which are master bedrooms with ensuite. The family area was large enough for all the family (7 of us) yet also felt cosy and homely. The major wow factor that this villa also has is the stunning location, unoverlooked with views of a nature reserve and canal. We spent many hours by and in the pool watching all the wonderful wildlife. The peace and tranquility of the location was very welcome after the hustle and bustle of Orlando. It was so nice to unwind and relax and enjoy spending time together. We love this villa so much that we have been lucky enough to be able to book again next year - Iâ€™m thrilled to be going back! Thank you Derek and Wendy. This is our 2nd stay at this beautiful villa, a lot of people return to this property and it's easy to see why. 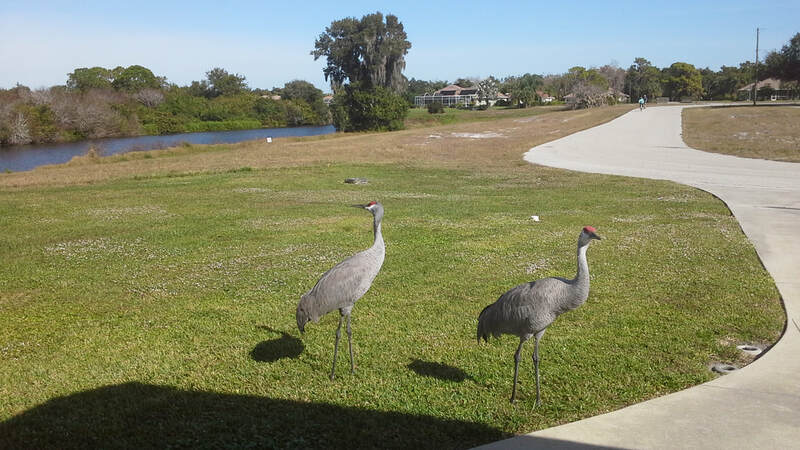 It's quiet and has a stunning view from the lanai of the nature reserve. It's close to many local amenities, shopping, beaches, cinema, baseball etc. Derek and Wendy stay there for extended periods so the villa is more a Home. Everything you could ever need has been thought of. Its in a local neighbourhood and all the neighbours are friendly and wave as they go about their day. Derek is fountain of knowledge on the local area. No question is too big or small. He also emailed during our stay to make sure everything was ok. When we return to Florida this will always be our First choice and we have no problem recommending it to others. Thank you Derek and Wendy for letting us stay in your beautiful Florida home. Just right This was our third stay at the villa and as usual it doesn’t disappoint, inside or out, it simply has everything you could need including a Christmas tree for our December 17 stay. The communication with Derek was first rate as usual and there is more than enough information on restaurants and the surrounding area to form the basis of a fantastic holiday. It is without doubt the best located villa on the Rotonda if you are interested in wildlife and we had daily visits from Sandhill Cranes, Wood Storks, Alligators, Turtles and a varying cast of other wild and wonderful creatures. We can pay it no greater compliment than we would and will return in a heartbeat. Title Won't ever go anywhere else anymore! So after a stay in July 2010 with our (then) 15-year old twins and just the 2 of us in April 2016, we were back again this September 2017 for 9 nights. Unfortunately that was the longest period still available to us, or we would have stayed longer (very happy to say we were able to get 17 nights in April 2018!). So after 9 nights in heaven, we had to move elsewhere. Well, that made us appreciate this villa, Derek and his Management Company all over again and even more! There just is no other place that is so well placed, so tranquil, so private, so surrounded by nature (but not overtaken by it like another place we stayed, which was very dark with neglected garden). What can we say? Everything and more provided, well maintained, all information about the villa and area on hand with Derek supplying the latest news and tips about restaurants, beaches, places to go. Home from home and the place to totally relax.... Maybe we shouldn't be sharing all this, as we wouldn't want the villa to get too popular with other guests ;-) Thanks Derek and Wendy, until next Spring! We have just come back from staying at this beautiful villa - "a little piece of heaven". The Villa is immaculate and very well presented, all home comforts are provided and it is one of the best villas that I have had the pleasure in staying in. The bedrooms are large and well furnished with plenty of storage space for clothes etc. A lovely large kitchen with everything supplied that you would possibly need, the family area was lovely for us to sit and talk about our plans etc as well as relaxing and watching a bit of tv. The villa also supplies beach equipment, towels etc which were fabulous to have and make use of on our numerous trips to the beach. The jewel to this villa is its location - overlooking a nature reserve. It was so peaceful and quiet and we took great delight in being able to be in the pool while having such a wonderful outlook. The children loved watching the many diffferent birds that came by the villa. The pool was lovely and warm and benefitted from getting the sun for the vast majority of the day. Finally I would like to say what a pleasure the owners were, Derek was wonderful in supplying lots of tips regarding the beaches, restaurants, places to see, he clearly takes great pride in his villa and it is evident that he knows so much about the area. It has been fantastic to stay in such a wonderful villa and I hope that we will be able to return one day. Beautiful Home in a Quiet Neighbourhood! LOVE! The house is very clean and we could have slept up to 8 in the house! We only had 5 of us, so we had plenty of room! The lanai and pool were where we spent our mornings and evenings, enjoying the quiet and visits with all of our siblings from different parts of the world. (We came from Texas, South Africa, and Indiana). Nice place to have a mini-reunion. Easy to find, too. Will hopefully stay there again sometime! Thanks, Derek! This was one of the best equipped villas we've stayed in and had many things you don't get in other villas. Every kitchen gadget you could wish for and lots of crockery and cutlery too. There were also cleaning items under the kitchen sink including washing up liquid. The pool area was lovely, and one of the largest we've seen with plenty of chairs and sun beds. We also made good use of the noodles to lazily float around in the pool! It's a very quiet area with the only noise from the wildlife and the occasional golf buggy. The villa was immaculately clean and well maintained. Derek was a pleasure to liaise with, and responded very quickly to all of our enquiries, which was particularly useful as we only booked the trip a week before we travelled! 2 weeks in this villa was not long enough. Wendy and Derek have thought of everything to make your stay as easy and stress free as possible. Villa was immaculately prepared for our arrival and we found the local management company to act promptly to any enquiries. This was our second stay in the villa, we found the peace and tranquillity of the location perfect for us. Derek and Wendy are a pleasure to deal with and answer all communications promptly - even from around the pool when they were at the villa themselves! Thank-you Derek and Wendy for the use of your villa, we had a brilliant time in your lovely home. The pool was great and our kids spent most of our time in it calling it the Disney pool, we visited lots of beaches and had great fun exploring parts of Florida that we have never visited before and enjoyed the relaxing atmosphere. The villa was excellent with everything we could have needed, it was nice to have a few basic items of food although most things I had brought from home there was bits and pieces that others might not have thought of and of course all the beach items we used daily. Overall we highly recommend this villa if you want to get out of the "Disney" bubble and explore the Gulf coast, there are lots of lovely beaches and the villa is a gorgeous location to come back to everyday. You gave us great information and were very helpful with your emails, thanks again, The Dougal's from Northern Ireland. WOW, this what we said when we walked in to this perfect villa, we are still saying wow now! The villa is in the most perfect position, plenty of space between the houses and not overlooked at all with no one to the right of the property at all. The villa is large, spread out nicely so you are not on top of each other (perfect for 2 families) but with a lovely living space in the middle where the family room and tv are and the kitchen together. The rooms are large with 2 ensuites, the master is massive with a to die for bathroom (my favourite room!) this includes double sinks, (on different sides of the room) a bath tub and separate shower cubicle. The other ensuite has a large shower in the bathroom. The other 2 bedrooms are twins and share the 3rd bathroom. Everywhere is decorated nicely and there must be everything you could want in this villa it is very well equipped from towels, both bath and beach, coffee makers, slow cookers a BBQ to toys, books, games...I could go on. There was not one thing we thought "oh we could do with that"
The pool deck is the best I have ever seen it is absolutely vast, plenty of room for tables, chairs and loungers, the photos do not do it justice, there is really a lot of space out there. The views are amazing, up and down the canal and over the nature reserve. The sunsets are beautiful from here too and the ceiling fan makes lovely evenings sitting out on the deck, watching the sun go down and seeing and hearing the extensive wildlife wandering around. The most noise you will hear is the old golf cart trundling over the bridge.The villa has a well equipped garage too, with 4 adult bikes which we did use to cycle around Rotunda West, beach equipment including chairs and umbrellas and cool boxes. I really cannot recommend the villa enough. The area itself has an abundance of beaches that are all empty, white sand and plenty of shells, quiet roads and really really friendly locals. This is a holiday away from the hustle and bustle and a way of seeing the real Florida, very different from Orlando and all I can say is very much for the better, you have to really experience it to appreciate it. Derek and his wife do everything possible to make sure your stay in their amazing home is as enjoyable as possible it has been a pleasure and we cannot wait to visit again. We have just returned after 2 wonderful weeks.. After a hectic week in Orlando it was wonderful to spend 2 relaxing weeks at this beautiful villa. This was our second visit, the first being in 2010. We never even considered looking anywhere else. If anything the villa is even better equipped than it was back then. We doubt there is better equipped and maintained villa in Florida. Dealing with Derek is just like having your best friend holding your hand. He is the font of wisdom about Florida, in particular about Rotonda West and its surrounding area. His attention to detail is second to none and you just know that he really cares. Every detail is covered with nothing left to chance. The location of the villa is brilliant. Very private overlooking the canal. Birds of all description visit along with the odd alligator and if your lucky you may see the bobcat. Don't look any further book it now. You won't be disappointed. 6 years laterSee review Malou Volkers The Netherlands July 2010: My husband and I were lucky enough to indeed be back for 8 nights last April and it was as if we had never left! Nothing had changed and the villa was still as well-maintained as it was 6 years ago. This time there were only the two of us so we didn't really need all that space but we enjoyed feeling at home and the tranquility very much. 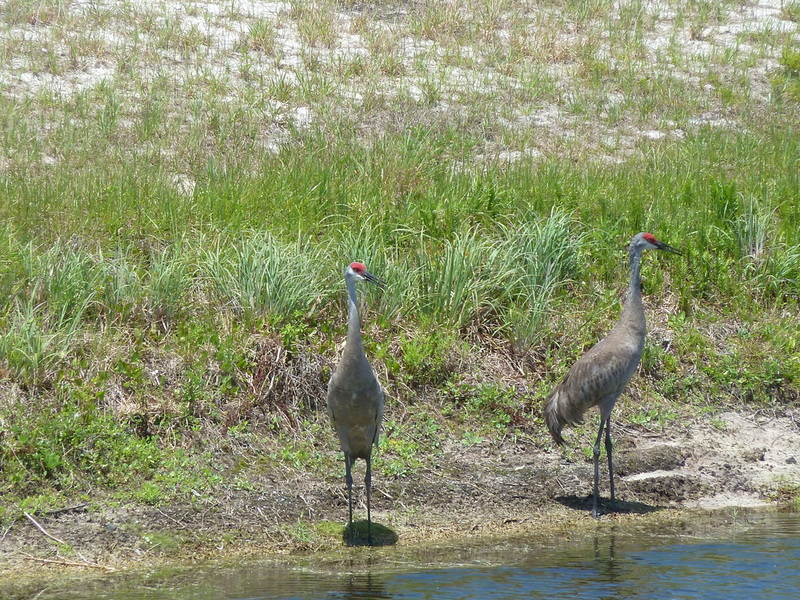 We saw all kinds of birds, wild boar, a big Gover tortoise crossed the street one time, a manatee swam by at 2 meter distance at Gasparilla Island when we stood knee-deep in the water and one evening we even spotted a coyote near Rotonda North Blvd! We have seen a big part of Florida by now, having traveled around 2 times 3-4 weeks, and have decided there is no better place to stay and no better placed villa in the best part of Florida, so next time we'll just stay at the villa for 3 weeks and visit places like Siesta Key, Tropicana Field St. Petersburg (1,5 hours by car), Port Charlotte, Fort Myers, Sanibel Island etc. by car from this lovely villa with all its comforts. Why bother finding another place if there is nowhere better than there?! We definitely hope to be back again soon! Thanks Derek and Wendy, we had a fantastic time again!!! UNFORTUNATELY (Hope that got your attention) there is nothing else we can add to the fabulous reviews already given here. Derek is a truly top bloke, who goes out of his way to ensure you are at ease from the moment you place your booking. If you have never gone DIY before then Derek really is the font of all knowledge to ensure you feel comfortable with every aspect of your holiday. Communication was absolutely first class. We were anxious to ensure that we got our first Christmas and New Year out of the UK off to a good start- and we did. The Villa is in a fantastic location on Rotonda, not overlooked and in a very quiet spot. Blue Heron and Egret pass by daily, and birds of prey wheel lazily overhead. We felt very much at home from the moment we arrived, and of course the kids loved the large pool. It's often the little things that make a big difference - the four beach chairs and insulated wheeled picnic box in the garage got lots of use at the local beaches which really are white sand heaven into shallow warm Gulf waters. Derek had even put up a Christmas tree and door garland in preparation for our arrival! For those wishing to travel further afield then St Pete's, Tampa, Sarasota, Boca Grande, Port Charlotte and Fort Myers are all easily reached by car. We have stayed many times in Florida Villa accommodation and this is by far the best. If you are looking for a truly relaxing beach holiday then you will not be disappointed. Everything from Waffle House to five star restaurant dining can be had within 30 minutes drive. Boca Grande is a gastronomic delight - be sure to visit Loose Caboose (lunchtime) and Pink Elephant (Casual but top class evening dining). Finally, a very personal thanks to Derek and Wendy for allowing us to share their Florida dream, even if it was for only two weeks. The memories will be with us for life and we hope to return. Many thanks. Massive thanks to you, Derek and Wendy, for allowing us to share your 'home from home' villa. This was our second visit to Englewood but first to this villa. Derek ensured excellent communication prior to and during the booking process and provided lots of excellent information relating to the area/places to visit/eat prior to our arrival. We definitely felt confident with our booking also very quickly picked up on Derek's passion for his villa, his love of wildlife and the fabulous area we would be re visiting. The villa was extremely clean on our arrival (shame it didn't stay that way long once we moved in!) and was very well equipped for our stay. Kitchen was well equipped, especially for longer hires when maybe you would cook more than we did. Garage had lots of beach chairs etc for a day chilling. The villa layout lends itself to a fabulous family home and one that two families sharing would not feel over crowded. The pool area and outlook is most definitely the highlight of renting this villa and the main reason we selected this villa for hire. The pool deck is the biggest we have ever rented in Florida but with the outlook over the canals and no properties to the west of the villa as its a nature reserve, gives the villa a real peaceful feel and without a doubt is the best feature of the Villa. There was an abundance of wildlife to look at whilst relaxing on the very comfortable pool furniture. It was so relaxing after the busy days we had had in Orlando. The villa has a folder with local information in it which can assist you plan your holiday. The beaches are so clean with white sand and blue sky. Gasparilla Island was fabulous especially when swimming in the sea, 3 manatees swam by fairly close to shore which was unexpected but an absolute bonus especially for the kids to witness. Local restaurants were great and lots to choose from although a couple of restaurants that we wanted to go to had closed for refurb as late sept/early oct is their quieter time prior to the 'snow birds' arriving for winter in the sun, there was still lots of choice for us though. Derek was also in contact with us throughout our stay to ensure everything was okay, which was a lovely gesture, we had no need to contact the management company for anything but we were encouraged to if we had any issues. We would not hesitate to re book Derek's villa if we are fortunate to return to Florida again and could guarantee if you enjoy peace and quiet and wildlife you will not be disappointed. Thanks Derek and Wendy for allowing to share your gorgeous home in paradise. Derek could not have been more helpful or pleasant to deal with. We know the area well and are regular Florida renters. This home is one of the best equipped properties we have stayed in and the owners do everything they can to ensure guests have a good holiday. We stayed as a couple but the property is very flexible and with two master suites the house is suitable for families, friends sharing or have the whole place to yourself! As the owners stay for extended periods there is more than the usual basic kitchen equipment and plenty of games, books etc to keep all ages occupied. The house is comfortably furnished and well maintained. Having beach chairs, sun umbrellas and cool boxes makes a day on the beach so much more comfortable and the beaches round Englewood are some of the best and least crowded in Florida. This was a last minute trip for us and we were more than happy with our choice of holiday rental. Derek and Wendy love their home and the area and it shows. Throw a steak on the huge BBQ and sip a glass of wine on the lanai and you will never want to go home. were there to see if everything was Ok and our security was refunded with days of returning home. The Villa is more of a home from home rather than a rental property with lots of little extras. If you like wildlife there is plenty to see as its situated on the edge of a nature reserve. There are many supermarkets located nearby. We had no need to contact the management company whilst we were there. I would highly recommend the Villa and would definitely go back there. Thank you for making our holiday perfect. This is beautifully maintained; it is probably the cleanest holiday home we've stayed in and we're quite particular! The villa is so spacious, our 3 children felt like they had their own wing. Derek the owner could not have been more helpful right down to providing us with an extra bike for our son. Something to note, you do need a car here as there are no ameneties within walking distance. However, the roads are excellent and everyone drives everywhere. We would really recommend driving the distance to Sanibel Island, an airboat tour in the Everglades, and a trip to Busch Gardens. All in all a fantastic second week to our holiday and this was very much down to staying in such a lovely villa. A very peaceful location. We found the house spacious clean and modern. A good sized southwest facing heated pool backing onto a canal and woodland. We especially enjoyed our evenings dining by the pool watching the sunset. We will return next year. This is a beautiful well kept villa, one of the nicest we've ever stayed in during our 25 years of visiting Florida. The nearby beaches are lovely and a nice change from the frantic pace of Orlando and the 'mouse'. If you like 'nature' you can't go wrong with this villa, being right on a nature reserve and close to several canals. The villa itself is large and comfortable and would easily accommodate two families with plenty of room for everyone. Derek, the owner is very easy to deal with and provides plenty of information about the area. I would highly recommend this villa to anyone. What a fantastic man Derek is - both Derek and his wife have gone above and beyond in helping us have a great holiday in their delightful villa. This was our third consecutive stay in Rotonda and the first time in this villa. Everything is to hand - there were only 3 of us staying so it felt (and is) enormous, two families can easily stay in this villa without getting on each other's nerves! It is on a huge plot surrounded by a canal on both sides, very tranquil and an abundance of wildlife. We had a blue heron called Ester that would appear outside the pool net every day along with two egrets that popped by too. Sitting on the lanai with a cold drink after packing away the entire contents of Publix (there are 3 Publix stores in this area) and listening to all the birds ... It's relaxing stuff! If you can prise you way off the lanai there is a lot to do in the area and fabulous restaurants are close by - one of our favourites was an Italian restaurant called Nicola's. We went to a Charlotte Stone Crabs game which is ten minutes from the villa and was a great night out. The shopping mall in Port Charlotte has a Macy's as well as a lot of other big shops. The outlet shopping mall in Ellenton is great for some bargains. 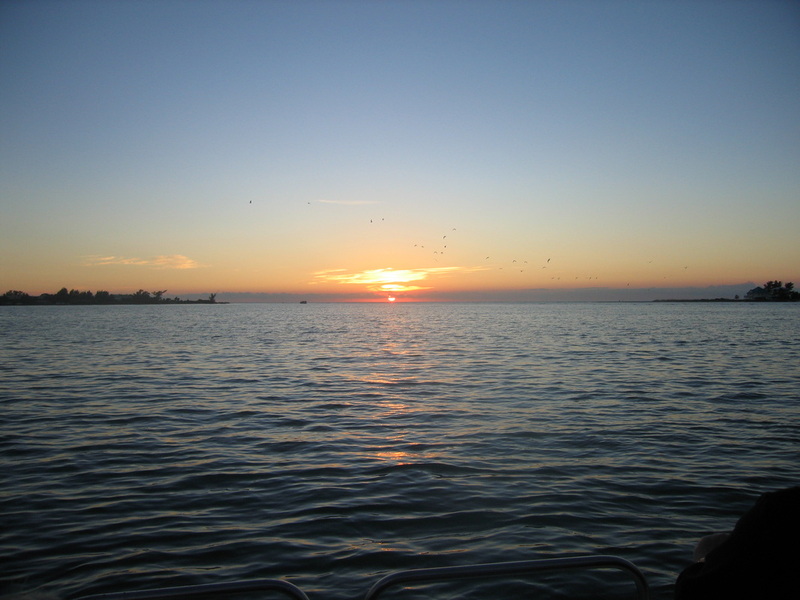 The Mote Aquarium in Sarasota, the most spectacular sunsets from Stump Pass Beach, lemon Bay Tours do nature cruises where we watched pods of dolphins - even two babies! We went out for the day, fishing with a skipper ... I have never been so hot...but it was an experience. I cannot compliment enough the villa, the management company whilst out there were brilliant too, Derek's attention to detail is second to none he wants you to have a great holiday and we certainly did. I cried when we left, we shall definitely return, we have been bitten by the Rotonda bug and there is no getting over it! Now just to get my lottery numbers to come up and I'll be on Gasparilla Island in a glitter sprayed golf buggy! I cannot compliment enough the service provided by Derek and this superb villa. We have stayed in many different villas in Florida, both out on the superb gulf coast and in the Orlando area. This villa really does not want for anything. It's is furnished very well and has everything you could wish for for either an extended or short stay. The location is peaceful but also near enough to shops and numerous places to eat. The communication with Derek at all stages of the booking process was first class, giving me great confidence my booking was in very safe hands at all times. 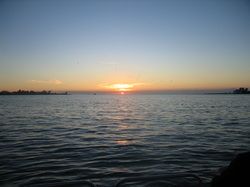 The experience of sitting on the beautiful stump pass beach and watching the sunset is not to be missed. We will definitely be returning again. The location of this villa was extremely peaceful and quiet. It was very tastefully decorated, very clean and well maintained. The owners Derek and Wendy were a pleasure to deal with, being extremely helpful with local information and maps. We would highly recommend this villa to anyone seeking a quiet location with great views along the two canals which wrap around the property, affording glimpses of the local wildlife. The villa itself is extremely well equipped including bicycles, beach chairs and umbrellas. We have enquired about a second stay and this is an extremely sought after villa. If you are thinking of booking it - do not hesitate! Villa ideal for a family group with 2 master ensuites. Located in quiet location within overall Rotonda development. Very close to Golf Club house and 3 challenging 9 hole courses. Excellent access for local beaches, supermarkets and the Mall at Port Charlotte. Overall a great villa and Derek was on hand to answer any queries before and during our stay. Thanks again for letting us rent your villa. Would definitely recommend. If you are looking for an extremely quiet and private location this four bedroom villa more than fills the bill. Located at the end of a street traffic is minimal. No neighbours on either side add to the feeling of exclusivity. All amenities are close by with a ten minute drive to Englewood,Placida or fifteen minutes to Port Charlotte. Golfing ,fishing and shopping are virtually on your doorstep.Walking trails and bike routes are a one minute walk. The house itself is great with all amenities and the management company is the best I have encountered in my previous stays in Rotunda.The owner is excellent to deal with. THANK YOU Derek and Wendy. Your home is beautifully decorated and furnished. It lacks nothing in the line of pots, pans and utensils. More than adequate bch towels and linens. 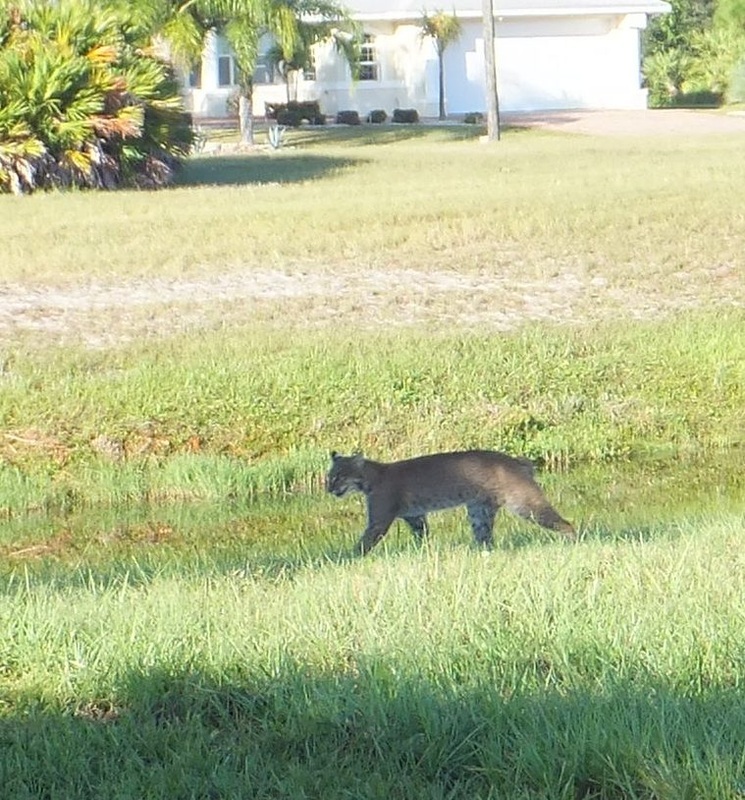 We were happy to see a bobcat on 3 occasions and alligators in the lake. It was so relaxing to sit on the lani to listen and watch the many birds who frequent the area. The pool was nicely heated and we made good use of it. Before we left we were sure to have our vacation home booked for 2014. A GOOD TIME WAS HAD BY ALL. We were very satisfied with the accommodations during our 10 day stay in Rotonda. The house was very clean and well maintained. The layout of the house was great with kitchen and family room centrally located and two main bedrooms on the opposite ends of the house. The location of the house was private, the pool very nice and the lanai very specious and well equipped. The owners are very nice, easy to deal with and helpful. For us the best beach was on Gasparilla Island, the $6 bridge fee is well worth the visit. Boca Grande is charming and great place to visit on the way to the beach. A beautifully kept villa in a very peaceful & private location I cannot fault the service provided by Derek Birchenough prior to & during out stay at the villa Tranquility. 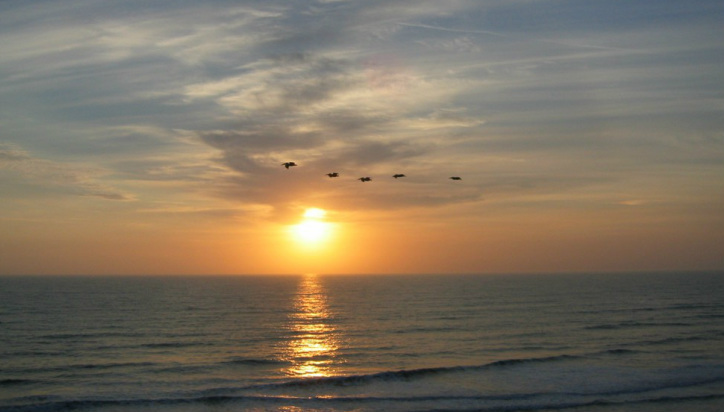 The location is perfect for a very peaceful & relaxing holiday. The villa is very spacious & very well kept, perfect for two families or extended family. The pool & deck area are lovely and really private with plenty of space for children to play with an area to relax & eat under the lanai. There wasn't anything that we thought I wish they had ... - it was all there. There are plenty of beaches to choose from & many restaurant options although we chose to eat (barbeque) at the villa most days as we were all so comfortable there. We travelled up to Orlando to do 'Disney' for 3 nights midway into our holiday which was amazing but was also nice to know we had the villa to come back to for a few relaxing days before returning home. Have just had a week staying in this lovely villa. The property is huge and would easily accommodate two families - only four of us so had plenty of space. The bathroom attached to first master suite fantastic. The villa is decorated to reflect beach location - light and airy. Plenty of space by the pool to sit and watch the local wildlife. The owner has thoughtfully provided beach/pool towels, coolbox, umbrellas and beach chairs - all the equipment needed for a relaxing day by the sea. Wanted a relaxing location after three hectic weeks doing the parks and that's what we experienced. The local beach of Englewood has lots of facilities but is not over developed. The beach at Boca Grande has restroom facilities though no shops etc. Wonderful Homely Stay What a great find! We booked based on all the great reviews and weren't disappointed. The pictures are very accurate and the unit was so clean and perfect. The house is very nice. Bed was very comfortable. Everything is top quality. No sparing of expense here. Your home is absolutely beautiful. We arrived late in the afternoon totally tired but when we stepped into your front hall we were totally blown away by how beautiful it is. Your pictures do not serve it justice. Everything was spotless and the notes helped us navigate as to where everything is. Thank you Derek and Wendy for allowing us to use your beautiful home. We had everything we needed and more. The villa was so peaceful and quiet. We visited the local beaches and did some shopping in Englewood and Port Charlotte. The binder you left with things to do was greatly appreciated. When we come back in April 2013 there are several local eatery places we are going to try. The boys enjoyed golfing at the local courses and the golfing was excellent. Thanks again for everything. It was a pure joy booking with you and you making things so easy and comfortable for us. We spent two wonderful weeks in Florida! After several months working very hard we wanted to have a special christmas vacation. It was the kind long helpful and personal messages from our landlord Derek, that made us, choose this villa, and the house was just perfect. Very clean and well equipped, lots of space and wonderful pool and lanai. We got very much good information about the villa and the surroundings before we arrived there and also from the house manuals. The location was ideal for us: many golf courses near and a quiet and safe area for a family with kids (and parents who does not need any bars or night clubs anywhere near). A wonderful place to stay, we took this villa for two weeks, the first with grandparents as well as our three teenage daughters, the second was just our family of five. There was plenty of space for everyone and the house was very comfortable. Lying around the pool was great, with plenty of local wildlife to watch - herons, egrets, pelicans and even a bob cat and her cub one day. The beaches locally were lovely too and we found other interesting stuff further afield, including a long day up in Universal which the teens in particular enjoyed. Local restaurants were friendly and good quality. Bikes provided by the house were great for everyone to do a bit of independent exploring and exercise. The pool was great. Would love to go again one day! One to recommend, location is key to this villa, privacy and water view are 2 key components that are met. Internally, the villa is very comfortable and is extremely well equipped, especially appreciated the beach chairs and sun umbrellas, made for a comfortable outing to Boca Grande. We would very much like to return and will recommend to others. We truly enjoyed our stay at Tranquility. Something for everyone, a very quiet, friendly neighbourhood with everything close by. My wife and I had great days at some terrific beaches (usually within a 10-15 minute drive) from the villa, and really enjoyed our bike rides every morning and walks around the picturesque golf courses beside us. Getting up every morning to enjoy a coffee outside and listen to the many birds singing was very relaxing. The canal behind the property is beautiful and abounds with many waterfowl especially very early morning. One of the biggest surprises was when one evening the bobcat bounded through the back yard over the canal bridge and into the trees! All in all it was just a great, very relaxing vacation .The villa is very clean and well maintained in a quiet, safe neighbourhood. It was a pleasure dealing with Derek Birchenough who had everything very well organized,(instructions in the house were great also) and we encountered no unwanted surprises, before, during or after our stay. We would highly recommend this villa and the owners to anyone wanting a memorable vacation! Home from home, It was such an easy process of renting the Villa, I felt like I knew Derek just through the emails that we sent. The Villa was a home away from home! Everything you could think of was there! Rotonda is a very nice area, quiet setting while neighbors are near! We enjoyed our stay, would love to stay again sometime!! "Perfect holiday" Wonderful villa with a perfect location. Very welcoming and felt at home immediately. Lots of varied wildlife to be seen even a close encounter with a turtle. Even after 3 weeks we could have stayed longer and having been home only 2 days we are missing it already. Cannot wait until next time!!! Large, beautiful villa with great sunset view from the lanai, great accommodation for a large family or even 2 families, since it has 2 master bedrooms both with ensuite bathrooms - the one in the #1 master bedroom is something to behold - plus another full bathroom for the other 2 bedrooms. The south-west exposure for the lanai/pool area gives you sun from 9 in the morning until sunset - a spectacular view. The privacy of the villa since it is located by itself at the end of the street allows you to enjoy a very peaceful and relaxing vacation. Added bonuses are the 4 bikes that the owner has provided - one with a baby seat attached - and all kinds of floats and toys for the children to use at the pool or the beach. 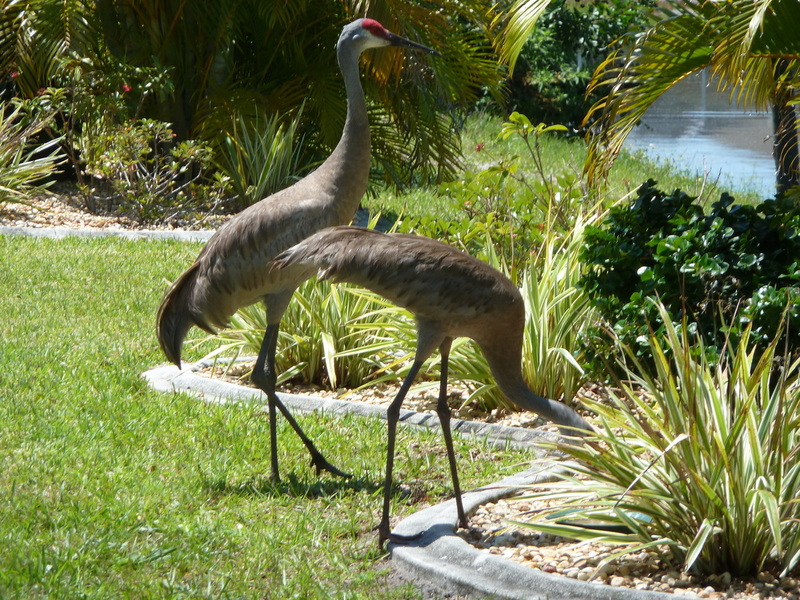 As you are relaxing pool side in the lanai, you may see all kinds of wildlife especially many species of birds etc. The tranquility, the scenery, the luxury, the space, everything was just great!!! As we (parents and 15-year old boy/girl twins)had already heard about this place a lot from friends who stayed here in 2008, we had high expectations. But it was even better than we expected! This is clearly not just another rental home, but a home that the owners take loving care of. It is kept in tiptop shape and well cleaned. Gasparilla Island beaches are amazing and almost empty and there are plenty of shops and restaurants only a short car drive away from the villa. The extensive information we received beforehand from the owners saved us a lot of time because we could go directly to the places which interested us the most. We are certain we will never find a better equipped and situated villa ever again. Thanks Derek and Wendy for letting us stay in your beautiful home. We hope to be back some day! Six of us stayed in the villa and thought it was great! It is exceptionally well equipped, very comfortable and was very clean and tidy when we arrived. The owners sent us lots of useful information before we left the UK and kept us up to date on recent viewings of the wildlife. The nearby beaches are very good and we found plenty of good places to play golf and eat out. I would definately recommend this villa and location. The villa was a tranquil delight. If you are a bird lover as I am it was a real treat. In the morning you share your coffee with the symphony of birdsongs. From simple mockingbirds to herons and whole flocks of ibis and the egrets are a photographers dream. From the initial booking to the leaving date including the 'welcome home' e-mail and telephone call on arrival home every detail was handled with professionalism in a friendly manner by an owner who really cares about the customer experience. Additional extras such as the provision of a gas BBQ, bicycles and beach equipment just added to a perfect holiday. Having stayed in various villas in different areas of Florida I can confidently say that it doesn't get any better than this. Many thanks to Derek and Wendy for a truly memorable holiday. We booked this house at the last minute, and worked directly with the owner. Derek was very pleasant to work with. We were a little leery, as we have never rented a house before. So we weren't quite sure what to expect. Well the house and the location exceeded our expectations. The pictures certainly did not do it justice. The house was beautiful! Very spacious and very clean. And to have our own private pool was just amazing! The house is close to beaches, restaurants and shops. But we had a great time just lounging by the pool! And the fact that the house backed onto a wildlife reserve was such a bonus. Within 15 minutes of arriving, we saw turtles, Herrings, and even a small gator!! It was amazing. Thank you Derek and Wendy. We hope to come back again next year. "Very nice home, very clean and nicely decorated. Located at a "junction" of a canal, with water behind and to the side. Spacious grounds. Very pleasant pool area. Area full of natural wildlife. Adjacent to 27 hole golf course. About 20 min drive to many restaurants (usual chains) and about 15 minutes to beaches and the beautiful Gasparilla island. Would recommend staying here and owner is very good and cares that his guests have a good stay." "We recently spent 2 weeks at this villa, and could not have asked for more. Everything was exceptionally clean and tidy The villa itself is idealy located, a fantastic place to relax and watch the various wildlife across the canal and lake. - We were lucky enough to spot a couple of small gators, numerous fishing birds and the highlight was without doubt a bobcat. Would completely recommend this villa, and the professionalism of Derek and Wendy made the booking and planning of our holiday a pleasure." "I am in Rotonda at the moment for a week in a spacious superb villa (thanks Derek). Having never been in this area before I was unsure of what to expect but it has exceeded expectations. The beaches are second to none (saw an iguana in the car park), great restaurants, wildlife a plenty. This seems like the 'real' Florida". "Stayed at Pine Valley Creek Villa when I recently visited Florida on a business trip. I thought that staying in a villa with all that extra space would be much better than being cooped-up in a faceless hotel. What an inspired decision! The location is great, nice and quiet and very private. The villa is beautifully presented and spotlessly clean and after a long day of meetings there was nothing better than sitting by your own private pool with a cool beer watching the sunset and the wildlife - truly an oasis of tranquility and calm. Derek and Wendy called during my stay to ensure everything was OK and there's lots of info in the villa for places to eat, shop, golf, fish etc. I can't speak highly enough of the place and I will certainly be using the villa again when I return to Florida." "We really enjoyed our stay at this wonderful villa, which is located in a nice and quiet area."